Fraser Gilbert: In recent years, I have to admit that I haven’t spent much time with the Universe Mode. I’ve always enjoyed the idea of it, but the execution has failed to grab my interest for the most part. That’s why I’m particularly excited to hear that shows have been updated to offer more immersive presentation elements. In order to remain invested, I want to feel like every match, promo and encounter matters. I hope this will be the result of the new changes. Aside from that, the additional save slots are a nice touch. The re-done menus look clean, and I can’t imagine getting much closer to an authentic brand-split scenario than the way it was shown off in 2K’s blog, aside from major updates to the game. It’s a potentially big blow to 2K that the development schedule couldn’t include the draft, but this should go a fair way to solving that problem. I can’t fault what I’ve seen, I just hope these additions will allow me to feel more immersed in the mode this time around. Josh Houtz: I’m a bit disappointed they had to use a workaround to essentially have the game mirror what we see on Monday and Tuesday nights as it is essential in trying to get a real representation of the WWE Universe. The brand split is something I look forward to seeing in next year’s installment. Nonetheless, you do have to applaud 2K for giving fans a real workaround with the brand split. In the past, I steered away from Universe Mode, but I look forward to giving it a try this year. 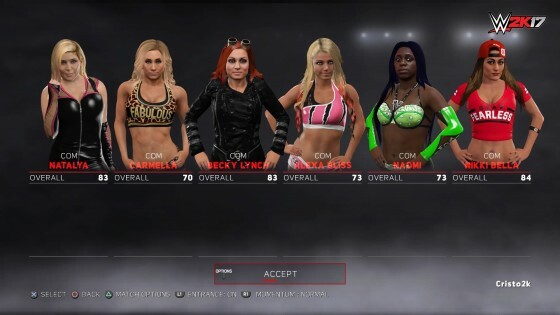 I remember playing the original SmackDown games into seasons 2019 because the game always kept me coming back for more and more. Hopefully this is a much needed change that allows every match to have an impact on the overall outcome. The menus also have a No Mercy feel to me. I love having the ability to interfere in a match and battle opponents backstage. It’s everything I could ask for in a video game. Obviously, they need to improve on things from their previous installments, but 2K17 has a chance at being the most realistic wrestling video game in years. 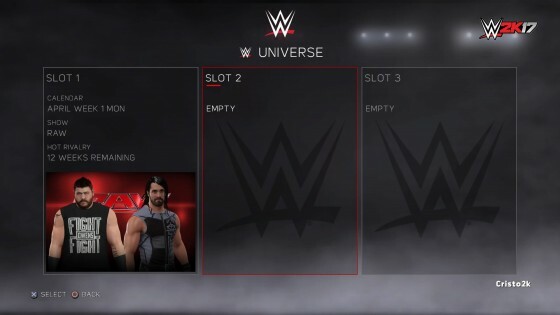 Chris Sanner: Universe mode has been the mode you hear about and get all excited about the possibilities only to find out half of what you thought would easily be in the mode wasn’t actually there. With that said, there are some nice additions to this year’s mode. Promos and run-ins are two much needed additions — and the greater customization is welcome. However, I can’t help but wonder if this is another year where you will be left wanting more than the mode actually offers. It’s unique in the sense it does more than just about anything else in this type of game ever has, but it still has been short of similar type of sandbox modes in our genre.